The Malina consortium includes cutting-edge expertise on every aspects of the Malina project (processes, modelling and remote sensing). In addition, because the Arctic marine environment is peculiar, several specialists of the Arctic (many specifically of the studied region) are involved. A total of 66 scientist, technicians and postdocs from several different laboratories will contribute to Malina. Several Ph.D. students will join the project once launched. In the two following sections, we list the different laboratories involved and their expertise. - In situ optics for satellite ocean color calibration and validation. In order to organize more efficiently to activities of the Malina consortium, we identified a number of teams for the main topics of the Malina project. The composition of working groups is provided below. Note that the coordinator, Marcel Babin, will be involved in all working groups. This group has expertise on various aspects of the vertical flux of particle using different techniques and platforms (e.g. sediment traps, video profiler ), and on the fate of organic carbon in superficial sediments collected using a box-corer. This group includes specialists of archea, bacteria and phytoplankton, and of the use of various techniques (pigments, flow cytometry, microscopy and molecular tools). Importantly, the group includes a well-recognized specialist of the Arctic Ocean (C. Lovejoy). One member is in charge of linking biodiversity with processes. This group covers both the study of phytoplankton physiology (photosynthetic parameters and other properties) and that of primary production (net, new, regenerated), as well as nutrient assimilation. Two are specialists of the Arctic Ocean and have worked previously in the Beaufort Sea. This group covers various aspects of bacterial activity, including: i) the measurements of bacteria growth and respiration, ii) the impact of DOC bioavailability, iii) the determination of limiting substrate and other factors such as temperature of bacteria growth, iv) determination of bacteria activity on particles, v) modelling of the microbial food web including experimental studies, and vi) arctic bacteria and their actvity. This group includes amongst the best specialists of the study of DOC chemistry, CDOM photo-oxidation and CO2 measurements, especially in the arctic environment. Finally, this group includes two specialists of descriptive physical oceanography and ice dynamics, and one modeler. This group is composed of scientists from LOV, NASA, SIO and UQAR. Most of them are leaders in the field. The group covers: i) in situ measurement of optical properties, ii) modelling of light propagation in the water column for open ocean and coastal waters, iii) development of ocean colour algorithms both for atmospheric corrections and inversion of the ocean colour to retrieve relevant biogeochemical variables. Many are involved as experts in ocean colour missions from ESA, CNES and Nasa. Predictive modelling is a key activity of Malina for assessing the vulnerability of light-related processes in the Arctic Ocean. The expertise involved is varied and includes: i) modelling of ice dynamics and circulation in the Arctic Ocean, ii) coupled physical-biological modelling, including specifically in the Arctic Ocean, iii) use of global climate model data to predict long-term trends in biogeochemical processes, iv) modelling of the processes of interest (primary production, bacterial activity and photo-oxidation) and of the microbial food web. This group involves three specialists of the use of geochemical proxies and biomarkers on sediment cores for reconstructing the past climate. Two have experience in the Arctic Ocean. All members of that group have experience in the use of remote sensing time-series for biogeochemical studies: i) algorithm development, ii) merging of data from different sensors of a given type, iii) combination of data of different types (ocean colour, SST, ice, clouds, ozone, altimetry, ...). The Malina project is coordinated by Marcel Babin from the Marine Optics and Remote Sensing Laboratory at Laboratoire d'Océanographie de Villefranche (LOV). Simon Bélanger of Université du Québec à Rimouski (UQAR), Rimouski, Canada, will act as PI on the Canadian side. MB will be assisted by Jens Ehn who will be in charge of implementing a Malina website, organizing the logistics of the cruise and of meetings, and managing the project data set. The whole Malina consortium will meet once a year, except during the last year of the project. Additionally, working groups on specific aspects of the project (list of working groups provided above) will meet once a year and hold telephone and web conferences. An executive committee composed of the coordinator, the Canadian PI (SB), the coordinator’s assistant, and of working group leaders (listed below) will meet apart once a year. Right at the start of the project, a website will be created to disseminate information to the participants and to the public. The website will also host the project data set. Our data policy will follow the guidelines of the International Polar Year and of IMBER. The Malina data set (in large part, data from the cruise) will be built on the model of the BIOSOPE data set and linked to the French national CYBER data base, with the assistance of the data base manager, Marie-Paule Torre from LOV. The structure of the database will be defined upfront, before the Malina cruise. Metadata will be entered right after the cruise. Our objective is to have a final data set ready one year after the cruise (end of year 2 of the project). Results will be disseminated through publications in peer-reviewed journals. Some of the papers will be published in a special number of a journal to be identified (possibly the EGU journal Biogeosciences as for the Biosope special number). The timing of the Malina, Arcticnet and CFL field campaigns is optimal. Recurrent cruises are programmed in the frame of Arcticnet every year from August to October (two 42-day legs). The CFL study held a field campaign in the Beaufort Sea that ran from the end of the Arcticnet 2007 campaigns through to July 2008. Together, Arcticnet and CFL cumulated a 15-month long survey in 2007-2008. The Malina cruise will occur in 2009 from the end of July to the beginning of September, just before the Arcticnet 2009 campaign. The 2007-2008 CFL and Arcticnet cruises will provide useful data for Malina, including for the preparation of its field campaign, and opportunities for collection of samples over a period longer than that of the Malina cruise itself. Our project has been endorsed by the IPY program (Expressions of Interest No 1180, part of the IPY project 26; see attached letter). We also intend to keep contact with the EC project Damocles (http://www.damocles-eu.org/) led by Jean-Claude Gascard from the LOCEAN laboratory. The Network of Centres of Excellence of Canada “Arcticnet”, led by Prof. Louis Fortier, aims at monitoring the impact of climate change on Canadian Arctic (land and ocean) beyond the next decade, both at the level of ecosystems and northern human communities. It is a multidisciplinary and trans-sectorial (natural, social and health sciences) initiative. The central objective of ArcticNet is to contribute to the development and dissemination of the knowledge needed to formulate adaptation strategies and national policies to help Canadians face the impacts and opportunities of climate change and globalization in the Arctic. For the first 4 years of the first phase which will last 7 years, Arcticnet got 26 M CAN$ of funding. Arcticnet is renewable for 7 additional years. Every year, Arcticnet uses the research vessel CCGS Amundsen to monitor the Canadian Arctic from east to west during 84 days, from August to October. Additionally, it created an observatory based on several instrumented moorings deployed in open waters. It thus offers a unique opportunity for time series in a quickly changing environment. In addition to natural sciences work, social and health surveys are carried out. Arcticnet involves scientists from 11 foreign (including 7 European) countries. The set of measurements made during Arcticnet cruises includes many variables relevant to Malina, and are compatible (protocols) with those made by ULaval in previous projects. Arcticnet will dedicate a special effort on data management. The created interactive database will comply with internationally agreed-upon standards and protocols. Additionally, it will include the data from the CASES and CFL projects. Therefore, access to data relevant to the Malina project will be relatively easy. Data sharing will of course involve agreement with data owners. The Canadian project Circumpolar Flaw Lead (CFL) System Study, led by Prof. David Barber from Univ. Of Manitoba, is the most important research initiative led by Canadians in the frame of the International Polar Year. 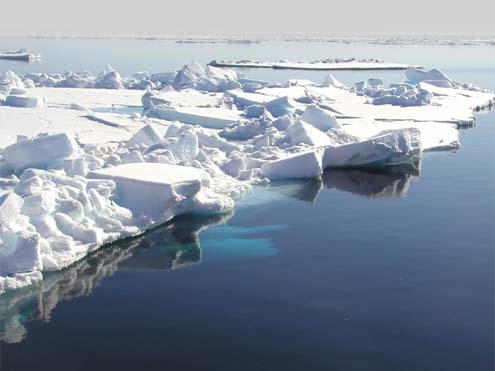 It aims at studying the biological and chemical processes ongoing in the ice-free zone that surrounds the Arctic ice pack, where critical air-sea-ice interactions take place. The major field activity of CFL was a 9-month deployment of the RV CCGS Amundsen in the Beaufort Sea, which started in 2007 (see below). 44 researchers from 12 different foreign countries participate in CFL. This project is funded by the National Sciences and Engineering Research Council of Canada, and the Canadian Federal IPY program.